Offloading coaches in South African football is one of the most preferred practices when soccer bosses are not happy with the results. 2011/2012 season has been one of the seasons full of drama. Coaches have been seen coming in and out of the teams, even on the big giants a lot of drama has been unfolding. Soccer bosses want results despite of the time you spend with the team trying to mold it. Ernest Midderndorp was seen moving from Maritzburg united to Golden Arrows. He did nothing much to improve the situation of Abafana bes’thende. He was again called to come and take over in Maritzburg. He is still currently with the team fighting for top eight. By the way Manqoba Mngqithi was the first coach to be shown the gate by AmaZulu less than five games. It was not a bombshell to see former Black Leopard coach Sunday Chidzambwa being fired. This is one team that never wastes time when results are not seen but smelled. Heric Vladislav was recalled to come and rescue the Limpopo (Black Leopard) side from the sinking ship. The team is currently pushing the relegation door hard so that they remain in the league’s next season. The news that Orlando Pirates has suspended and eventually sacked their coach raised eye brose to the South African football fraternity. His depature was as a result of his statement to the Bucs management when he said he could not see his way forward in the team, this came as a surprise as the Brazilian men manage to win the trophies. Augusto Palacious is care taker coach who is aiming to repeat the treble. The news that Platinum Stars coach Owen Da Gama was suspended by the team shocked many soccer fans. D a Gama is allegedly under scrutiny for taking money from players for game time and Cavin Johnson took over as the caretaker. The unhealthy relationship between Floyed Mbele and Da Gama is suspected to be having an impact on Da Gama’s suspension. The Motsepe boys (Sundowns) have an infamous reputation for not tolerating underperforming coaches and yet this season they are still holding on to Johan Neskeens. It’s so obvious others have learnt a lesson from Bafana Ba style. Is it a good lesson thou? One might say Santos had to get someone with a sober mind to come and rescue the people’s team as they have just hired former Mozambique coach Maart Nooj. Boobie Solomon had his chance but his ship kept on sinking. The Phefeni Glamour boys Kaizer Chiefs are the current news making team regarding coach firing machine. With less than 10 matches to go, Amakhosi has fired Vladimir Vermezovic. It has been a questionable decision as Chiefs is continuously digging their hole which might make it difficult for them to touch the league title; they might not even be closer to the winner. 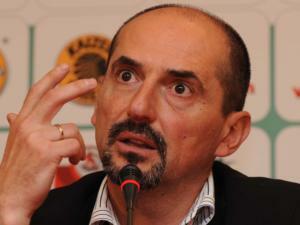 It has been a fascinating drama in the PSL seeing the Soweto giants sacking their coaches. The axing of coaches can go on till the beginning of the new season. To Leave us your comments below | Tell us what you think about the above article? Is Sono getting old and losing his touch?